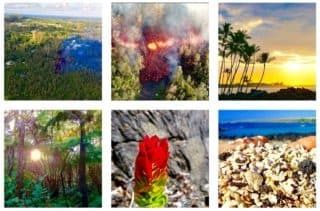 If you are vacationing in Hawaii and want to see more than one island (and you should if time permits! ), you will probably be taking several short (~ hour) inter island flights between the different Hawaiian Islands. These inter-island flights are short (often less than 1 hour in the air) flights that average at about $69 for a one-way ticket if you book on time. The trick to booking an inter island flight is to find the balance between “lost time”, in the form of a ~half a day of your vacation needed for travel, and the opportunity to see yet another fascinating island of Hawai’i. Read our inter island flight booking tips to see how to find the best flights. Tl;dr Investing 10 minutes of your time now to sort out your flights might save you money and hours of travel time while on Hawaii. Three other companies have recently discontinued their inter island flights: Island Air (2017), Go! Airlines (2014) and Aloha Airlines (2008). You can buy your tickets directly on the websites of these airlines or through comparison websites such as travelocity or expedia. There will be little to no price difference between booking directly or through an aggregator website. Hawaiian airlines (website) maintain a high level of service and has a good in-flight magazine to keep you entertained in the air and prepare yourself for your new destination. Hawaiian Airlines has the best inter-island flight coverage of all airlines discussed here and offers direct flights between almost all Hawaiian islands. They do so in collaboration with Empire Airlines from Idaho as the “‘Ohana by Hawaiian passenger service“. Hawaiian Airlines also offers many flights to Hawaii both from the mainland and from international destinations in Asia and Australia. Hawaiian airlines offers direct flights between almost all islands in collaboration with Empire Airlines (from Idaho) as “Ohana by Hawaiian”. 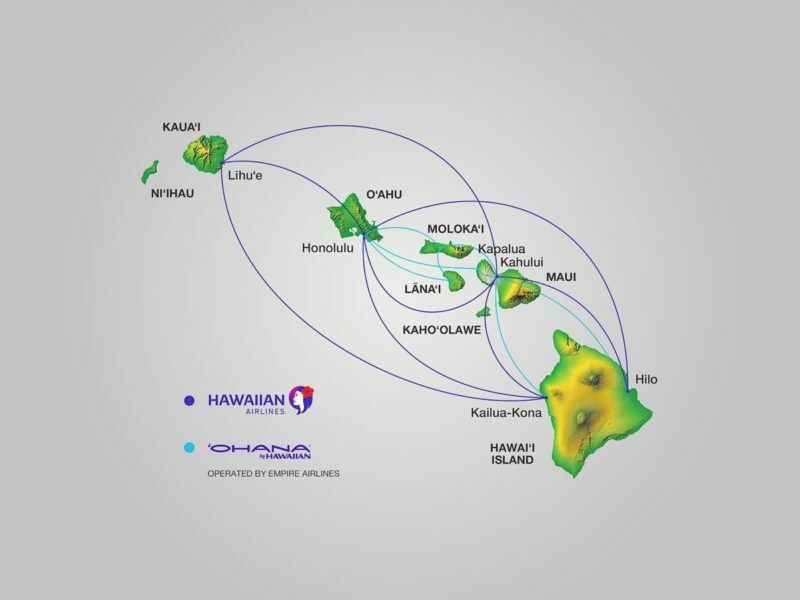 Map retrieved from the Hawaiian Airlines website in January 2019. The frequent flyer loyalty program of Hawaiian Airlines is called “Hawaiian Miles”. However, flying with Hawaiian airlines can also earn you credit for other frequent flyer programs, and miles from other programs can sometimes be used to buy flights operated by Hawaiian Airlines. These frequent flyer programs include Delta SkyMiles, American Airlines’ AAdvantage, the All Nippon Airways (ANA) Milage club, United Airlines Milage Plus, and many other programs. Read the complete list of participating airline programs and the rules on how to earn and redeem miles while flying with Hawaiian Airlines here. Hawaiian airlines sells so-called “travel plans”. This is a yearly program available only to holders of a HawaiianMiles account. With this program you can buy a set number of direct inter island flights to neighboring islands for a reduced price. Every travel plan is personal, which means you cannot use it to buy a ticket for somebody else. There are four programs available: two including 4 or 8 round-trip inter island flights, and two including 24 or 60 one-way flights. 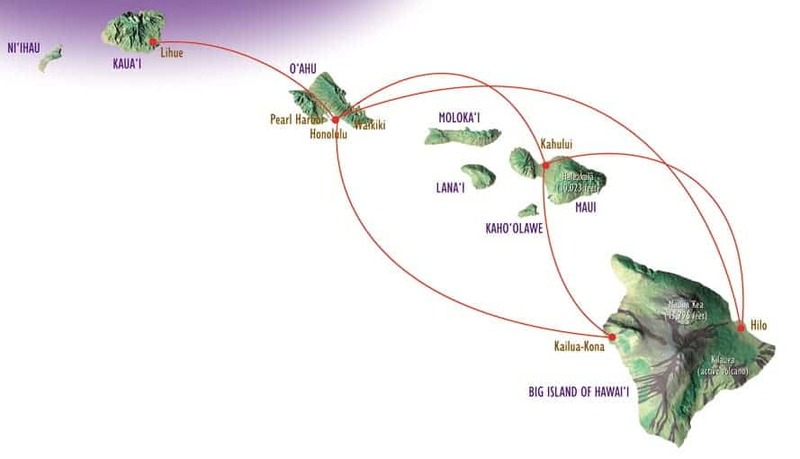 More information on the Hawaiian Airlines inter island travel plan. Mokulele (website) is the lowest fare airline, but since the distances between the islands are small, price differences never get that noticeable. Of the two companies offering inter island flights, Mokulele is the one where the customer service is in most need of improvement. Mokulele operates 120+ daily flights between most Hawaiian islands. These flights offers direct flights from Kona to O’ahu, Maui and Molokai. Mokulele also operates a direct flight (once a week) between the Kamuela-Waimea airport (IATA code: MUE) in Waimea and Kahalui on Maui. Mokulele operates 120+ flights per day between most Hawaiian islands. 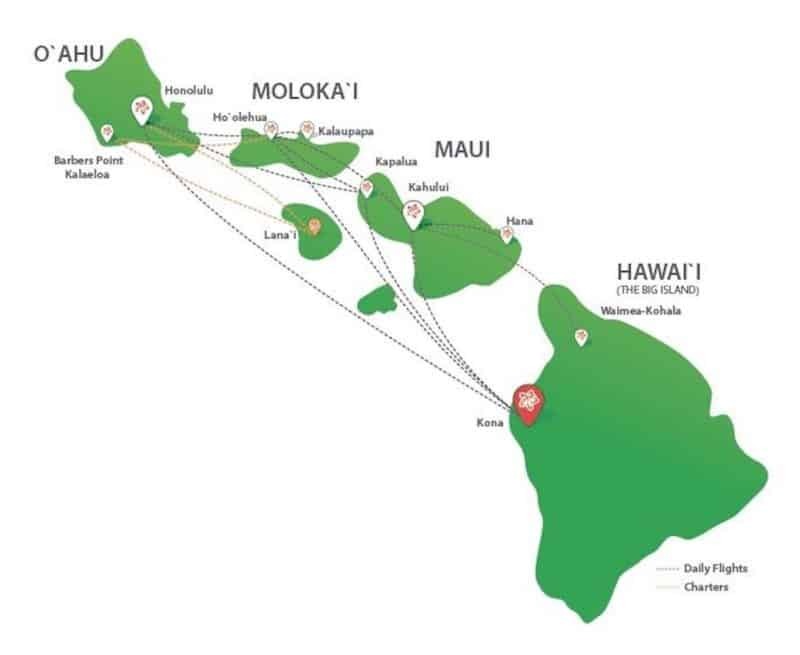 Map retrieved from the Mokulele Airlines website in March 2017. The frequent flyer program of Mokulele is called the ‘Imi Loa frequent flyer program’. Under this program you earn 1 free one-way flight voucher for every 12 full-fare, completed, one-way trips. See the website for more information. Southwest airlines offers low-fare inter island routes to the Hawaiian islands starting April 2019 beginning with flights between Honolulu (HNL, on Oahu) and OGG (Maui). Flights between HNL and Kona (KOA) start on May 12th 2019. Since Island Air went belly up in November 2017 only Mokulele can compete with Hawaiian Airlines, which currently holds a 90 percent share on interisland flights. Southwest airlines is a welcome new competitor on the interisland flight market. Important news: Island air has ceased operations on November 10, 2017. Oahu’s Honolulu Airport (HNL) is the central airport of Hawaii, while all other islands are often referred to as “neighboring islands”. This is important for you if you decide to book a flight between to neighboring islands, for example between the Big Island and Kaua’i. There are a limited amount of direct flights available between these two destination, while many other flights are routed over Oahu. These indirect flights are often a bit cheaper than the direct flights, but if you have to fly over Oahu you will easily lose another 3 hours of your valuable vacation time. We advise that you book direct flights whenever they are available, and perhaps even change the order in which you visit the islands if that means getting rid of many hours spend at the airport instead of on the beach. Another point to consider when booking an inter island flight is the time of your flight. You will find that the cheapest flights are often very early in the morning or late in the evening. Don’t be tempted to save $20 by booking such a flight without thinking about your check out and check in times. If you already have booked your accommodation, look up the check in and out times, factor in transport to and from the airport, and search for a flight that will connect the two as smoothly as possible. Keep in mind that there are two airports on the Big Island: Kona international airport and Hilo international airport. If you are planning to spend time on both sides of the island (and why wouldn’t you? A visit to the Big Island without a visit to the Hawaii Volcanoes National Park and one or two nights in Volcano Village is only half a visit), try to fly to one side of the Big Island and depart again from the other side. Interisland flights are short and during the flight you never reach altitudes that are normal on the longer (inter)continental flights. This means that looking out of your window can give you some spectacular views of the Hawaiian islands :). A trip to the Big Island almost always starts with a long flight to Hawaii of at least 5 hours. This plane ticket likely covers a significant part of the total costs of your vacation. Read our flights to Hawaii guide to find out how to find the best flights to Hawaii, when to book, and where to look. We always try to use Hawaiian airlines for the reason listed above. If you are planning your trip it never hurts to check as many airlines as possible. By clicking the link below you will see the best deals Hawaiian airlines currently has on offer AND support this website. If in the end you decide to book your flight through Hawaiian airlines and follow the link we get a small percentage of the transaction (from Hawaiian Airlines, it won’t cost you a thing). This, in turn, can help us to keep this website up and running. Read more on our participation with affiliates here.